It was a chilly September morning in the beautiful city of Basel, Switzerland. 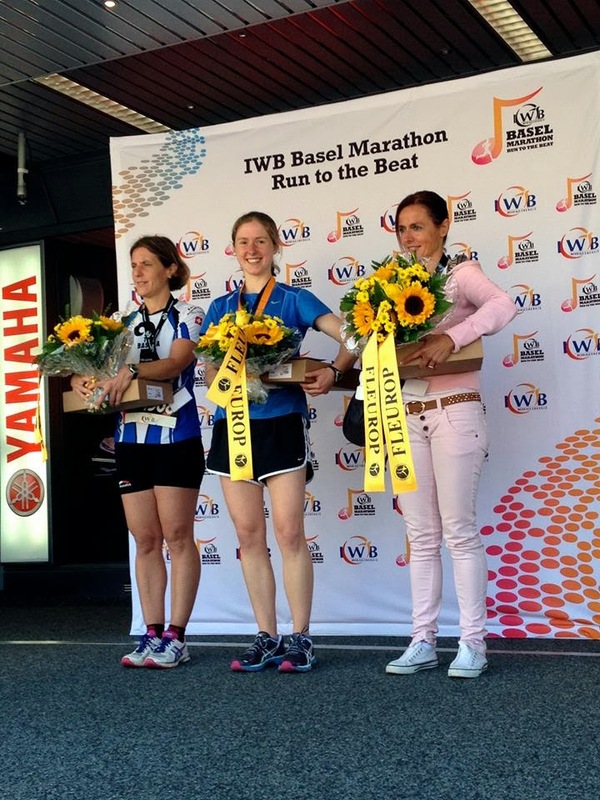 Runners from the surrounding regions came pouring into the city, eagerly anticipating the start of the Basel marathon, half marathon, and 10K. Crowds wearing brightly colored spandex, fluorescent warm-up jackets, compression socks, racing flats, wristwatches, and headbands filed in and out of the registration arena. 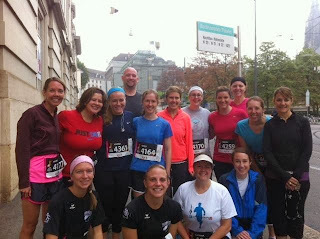 I breathed a sign of relief amongst these exercise-loving, morning-happy runners. Though I may have been thousands of miles away from my home in West Virginia, I knew at once that I had returned to my people. Well, this attitude lasted a good 6.7 seconds. As soon as I saw the start line with the hundreds of people lined up to race, I knew without a doubt what I was going to do. I was going to try to win the Basel 10K. By now, it was too late to change into my racing flats, but I could still manage a 4 minute jog around the start area. So jog I did, across the bridge spanning the Rhine River, past the little old lady who smiled at my smile (I like to smile at people when I’m running) and back to the start line. By now, the starting area was really getting crowded. The other BFAers urged me to go up near the front, but the best I could do was somewhere near the middle. In a pack of 538 people (244 women and 294 men), “somewhere near the middle” isn’t very helpful when you are trying to win a race. But it was the best I could do. I was about 2 kilometers into the race and I was still catching women. The strange part was that these women weren’t even running that fast. I couldn’t quite figure out why they would run the first 2K at 6:00-6:15 pace and then would just slow to a leisurely 7:15. Why go out so hard if they weren’t going to be able to maintain it? And to further complicate matters this guy on a bike kept insisting on biking right in front of me. He wasn’t slowing me down or anything, but he kept staying right in front of me and looking back to make sure that I was still there. He had said something to me in German when he caught up to me, but my German skills aren’t refined enough to comprehend much while racing. Not to mention, he had an obvious Swiss accent. We were getting near the 3K when I noticed some media people starting to get excited. They were pointing towards me and towards a sign that was attached to the front of the man’s bicycle. One of them called to the others, “Schau mal! Die erste Frau!” The bike made a sharp turn around a corner and I was able to catch a glimpse of the sign that was attached to the front. 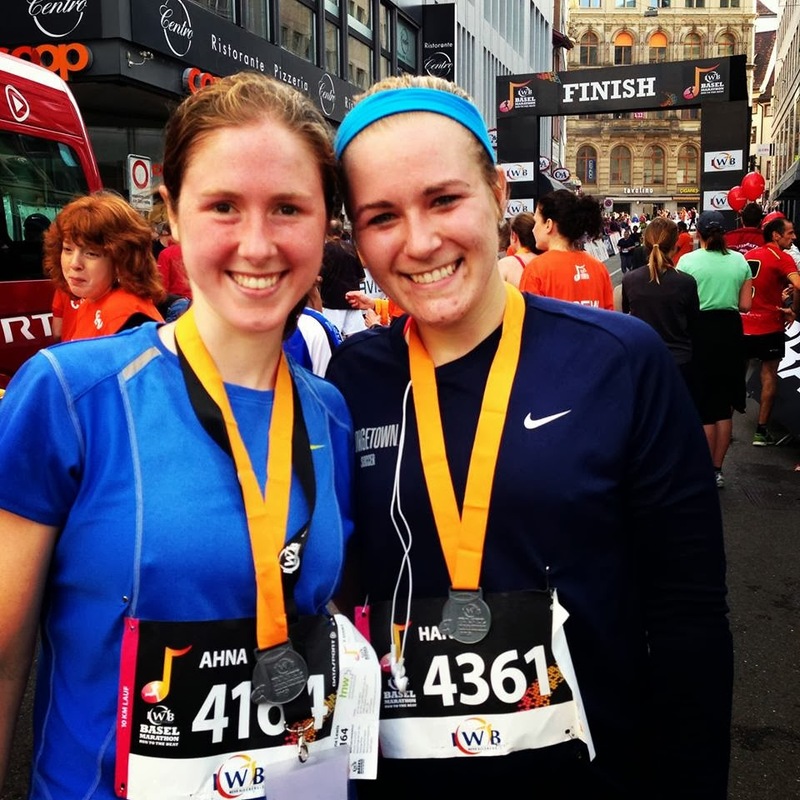 Sure enough, typed in big bold letters on the sign were the words, “10K Lauf 1. Frau.” At last, I was able to put the clues together. 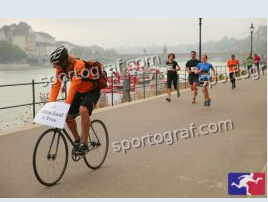 I was “die erste Frau” (the first woman), the bike was pacing me, and I was leading the women’s 10K. Those women who I had been so desperately trying to catch for the last 4 kilometers had been half-marathoners who had started their race about 15 minutes prior to the start of the 10K. I didn’t need to play catch up anymore, I was already winning! I realized then that it was time to put another game plan into action. “Maintain the lead, keep up the pace, and don’t let anyone (man or woman) catch me from behind. Oh, and keep breathing.” The congestion in my chest was not making it easy to breathe and I still had more than half the race to go. Though I was starting to get pretty fatigued, the second half of the race was filled with quite a few highlights. First of all, the scenery was beautiful! What better way to explore Basel than by foot? We made two crossings over the Rhine River and got to enjoy a number of picturesque views of the cityscape. The second major highlight was hearing the cheers from the other BFA teachers who were racing. There is a part of the course where the road doubles back and you are able to see the runners who are still coming in the other direction. The cheers of my friends during this section was exactly the encouragement that I needed to keep going. I even had the chance to cheer for them as well! The rest of the race finished in a blur of excitement as I rounded the final bend and took the turn towards the downhill finish line. I had maintained my lead and kept up the pace. Now all I needed to do was finish strong. To help create some additional excitement for the audience, my bike pacer decided to tell the man right in front of me (who I was about to catch mind you) that the first woman was right on his heels. Of course, this sparked some impressive sprinting on his end and I wasn’t quite able to catch him. 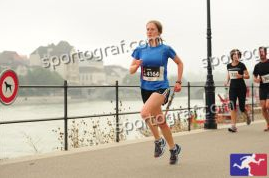 I crossed the line in 39:55…nowhere near what I could run in college, but not bad for a weekend in Basel. :) After the race, I attempted to chat with my new racing friends (the biker and the man who beat me to the finish line). It didn’t take long for them to realize that they were going to have to use English if they wanted to have a half decent conversation with me. Luckily, it ended up that they both spoke English really well and were more than happy to accommodate my lack of language skills. After grabbing some Gatorade, a banana, and a recovery bar, I waited at the finish line to cheer on the rest of my wonderful BFA teammates. 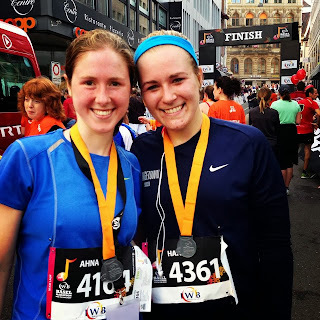 For a number of them, it was their first time to ever race anything further than a 5K. I was so proud for what they were able to accomplish! After all the runners had crossed the finish line, a short awards ceremony was held at the center meeting area. I had the opportunity to walk up on the stage and was announced as “Die erste Frau—ein Ausländer aus Deutschland!” (foreigner from Germany). Apparently, they had seen my German address on the race registration and thought that I was German. I was awarded a beautiful bouquet of yellow flowers, a water bottle, a backpack in the shape of a fish, and a gift certificate for a free appointment with a specialized Swiss sports doctor (worth 210 Swiss francs!) Although, I have to admit I am seriously hoping that I never have to use this prize. Overall, it was a wonderful weekend! To me, this race was a stunning reminder of God’s faithfulness. How thankful I am that God would allow me the opportunity to continue doing something that I love so much even in the midst of serving Him in Germany. I thank Him for the talents that He has given me and the opportunity to use these talents to meet new people, build relationships, and glorify Him. Please keep praying for me as I press on to win the prize here in Germany. No, in this case, not the runner’s prize. (Although you probably know that I like winning those as well…) But what I am really referring to is the heavenly prize—the goal of giving my life to serve Christ by teaching, serving, and loving the students here at this school. Enjoyed reading every word of this. :) Thanks for sharing your life with us! Congrats Ahna! Miss you. Enjoying your blog. Skype soon? Great presentation of your race. It was fun to read! Keep up the good work. God is so good!